Three out of four jobs the Idaho economy created last year were in the service sector. And, guess what, that is where the majority of minimum wages are. 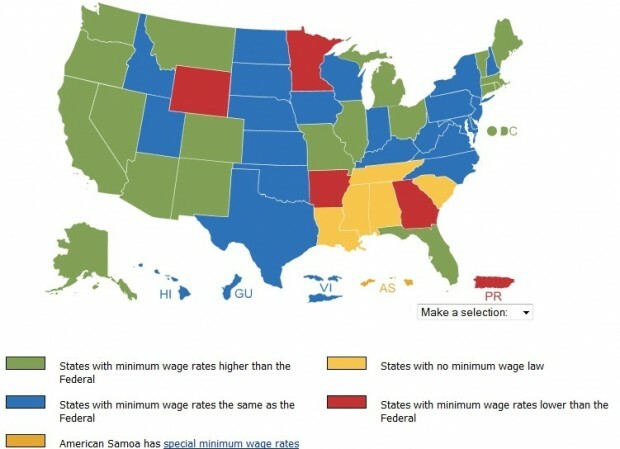 So, it should come as no surprise that Idaho leads the nation in minimum wage workers. The share of Idaho’s hourly workers making the minimum wage of $7.25 an hour – or less – jumped to 7.7 percent in 2012, the highest percentage in the nation. The U.S. Bureau of Labor statistics estimated that 31,000 of Idaho’s 404,000 hourly workers were paid the minimum wage last year, an increase of 12,000 from 2011, when 5 percent of the state’s hourly workforce made the minimum wage or less. That ranked the state 30th in 2011. At 7.7 percent, it was the highest percentage of minimum wage workers the state has recorded in the decade that the bureau has been making estimates. Idaho has one of the lowest minimum wages in the West. The hourly wage hasn’t changed in Idaho since 2009. As of January 1, the minimum hourly wage in neighboring Montana is $7.80. In Washington it’s $9.19, and in Oregon it’s $8.95. At the same time we learned about the minimum wage, it was reported that the very elected officials who are dead set against raising the minimum wage are getting their own pay raise. Honest to God, what is wrong with Idaho (Republican) voters? The Joint Finance-Appropriations Committee set budgets this morning for the governor’s office and the legislative branch, and due to statutory requirements, both of those include salary boosts for elected officials. Specifically, the governor’s salary was required by law to rise from $115,348 to $117,000 on Jan. 1, 2013, and to rise another 1.7 percent on Jan. 1, 2014 to $119,000. The approved budget covers that increase. For state legislators, a citizens committee voted in June to recommend a 2 percent raise, from $16,116 a year to $16,438. That raise took effect in December, and became permanent when the Legislature hadn’t acted to reject it by the 25thday of this year’s legislative session; today is the 52nd day.